Tata Hexa will launch in India in January 2017 and will compete with the Toyota Innova Crysta. Tata Motors has been riding high on the success of the Tiago which received positive feedback from the market, mainly due to the new design, which differentiated it from the rest of the Tata cars. The company calls this new design language – Impact, and they are now betting big on it. Tata will be launching their flagship car – Hexa in January 2017. Being their latest and greatest, how good is it to drive? Let’s find out. Right off the bat, you’ll notice that the Hexa has visual similarities to the Aria. That’s because the car is built on the same platform and has received the new ‘Impact’ styling. The honeycomb grill is accentuated by the chrome strip running under it. The Daytime Running Lights (DRLs) are cleverly integrated with the fog lamps and the flared wheel arches with smoked projector headlamps give the car a strong stance. It is from the sides that the similarity to the Aria really starts to show, but the Hexa gets ample cladding all around with sharper lines and chrome, giving it a more SUV-like feel as compared to an MPV. Interestingly, the Hexa’s wheelbase is identical to the Aria but the car on a whole is longer, taller and wider. The rear end of the car has a large chrome strip which continues all the way to the outside rear view mirrors. The wrap around tail lamps has an OLED strip, giving the car a premium appearance. Once you hop inside the car, the interiors will impress you. There are plenty of shades like polished chrome, piano black, silver accents and matte black. The more shades an automaker uses, the chances of the interior looking confused are higher, but not in this case. The design is neat and the quality of materials used inside is good as well. 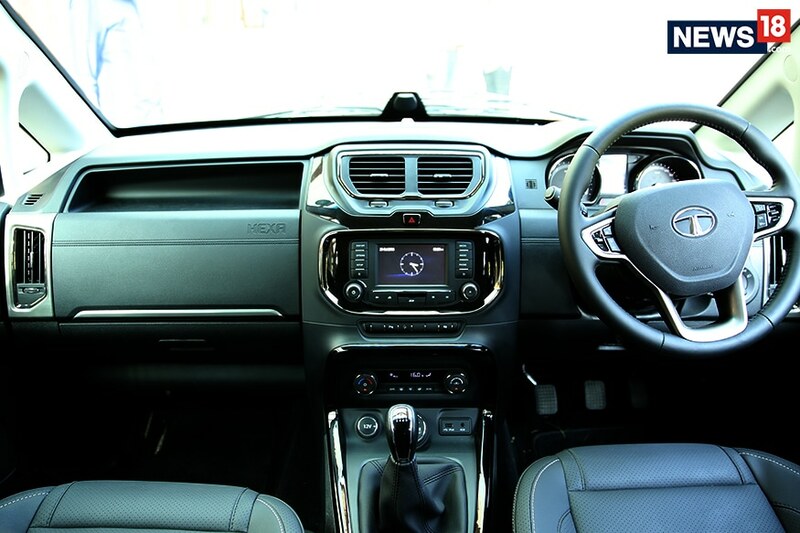 It offers conveniences like – a chill compartment storage sitting above the glovebox, steering-mounted controls for audio, telephony and cruise control and a total of 29 compartment spaces. There’s also customisable mood lighting that changes according to the drive mode selected. The main attraction inside the car, though, is the ConnectNext infotainment system by Harman that comes connected to 10 speakers inside the car for a great audio experience and supports AUX, USB, SD card and shows navigation through the NaviMaps app installed on the user’s connected smartphone. 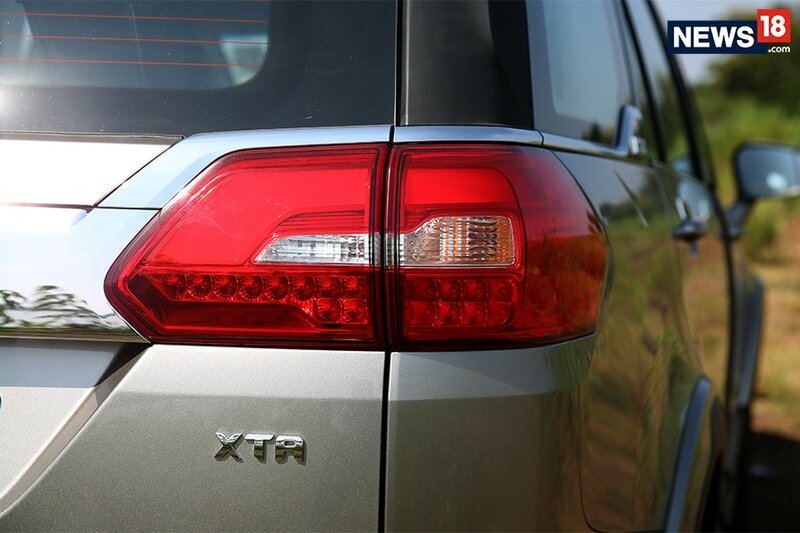 Powering the Hexa is the 2.2-litre Varicor 400 engine, which was first seen on the Tata Safari Storme. It delivers 156 PS of power and 400 Nm of torque, but in this scenario, it is a lot smoother and refined. There are two drivetrain options available – 6-speed manual and 6-speed automatic – but there’s more to it than just that. What’s the difference between automatic and manual transmission variants? 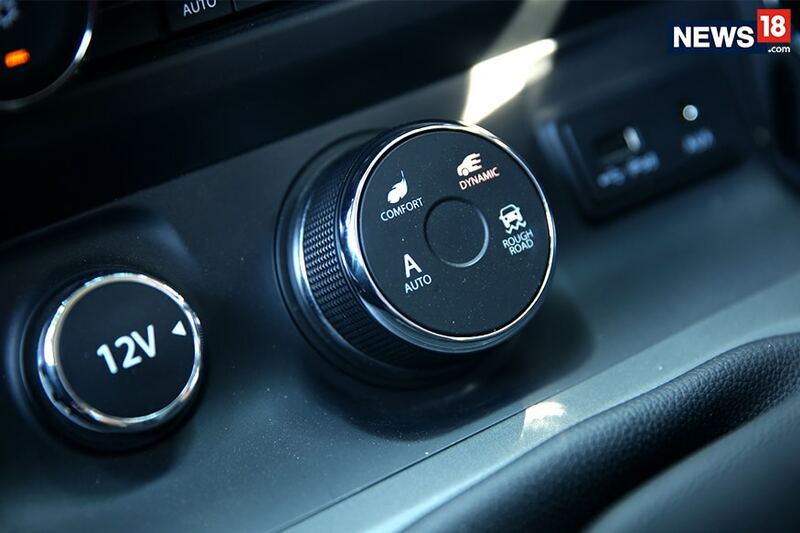 Other than the option of the manual and transmission gearbox itself, there is a difference in the drive modes that come with these variants. 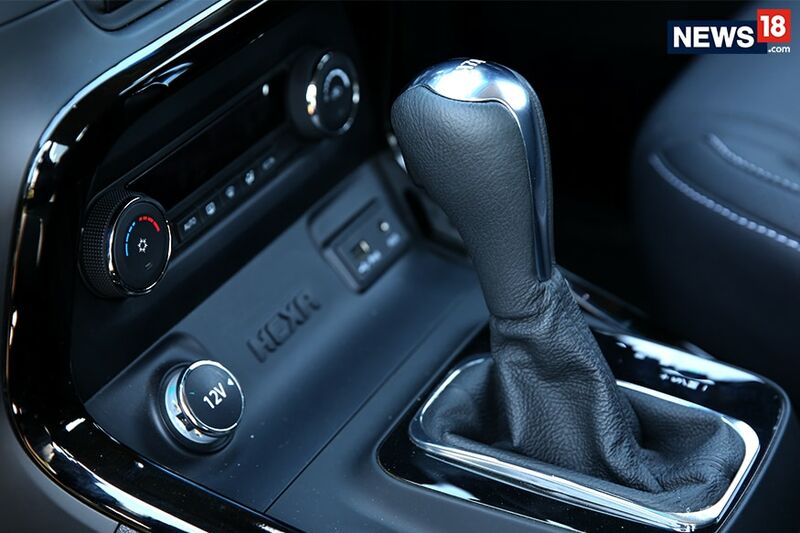 The 6-speed manual gearbox version comes with four selectable drive modes – Auto, Comfort, Dynamic and Rough Road. ‘Comfort’ is meant for city driving and focusses on delivering better fuel efficiency. Dynamic mode makes the throttle response a bit more aggressive and makes the car feel sporty. Interestingly, the car is driven by the front wheels in these two modes, whereas the ‘Rough Road’ mode switches the car to four-wheel drive for better off-road capabilities. ‘Auto’ mode basically switches between all these modes depending on the input from the driver on the steering and the accelerator. In terms of usage, the manual gearbox is easy to operate. If we talk about the automatic transmission variant then it misses out on all these drive modes. What it gets instead is a ‘sports mode’, which makes the car feel livelier with gearshifts at higher RPMs. Tata says that there’s also a ‘Race Car mode’ – which the car switches to if it senses that it needs something sportier than the ‘sports’ mode. Unfortunately, the driver cannot choose when the car goes into that mode and neither can the driver prevent it. In terms of usage, the gear shifts on the automatic transmission variant are smooth and there’s a manual mode too. Keep in mind that the automatic transmission variant will only be available in two-wheel drive. The Hexa’s steering feels a bit heavy at first and takes a while to get used to. But once you do, the steering feedback is wonderful and the car feels planted on the road even at high speeds. The brakes have good bite and the driver is seated in a commanding position, something that regular SUV drivers will appreciate. The Varicor 400 engine feels peppy to drive. What’s most impressive aspect about the car is the array of driver aids and electronics on offer. There’s hill hold assist, hill descent control, ESP with traction control, which when coupled with the drive modes and all-wheel drive available in manual transmission model – allows the car to be a capable off-roader. The design team informed us that MRF has specially designed the tyres which are meant specifically for the Hexa in order to offer better grip and performance. 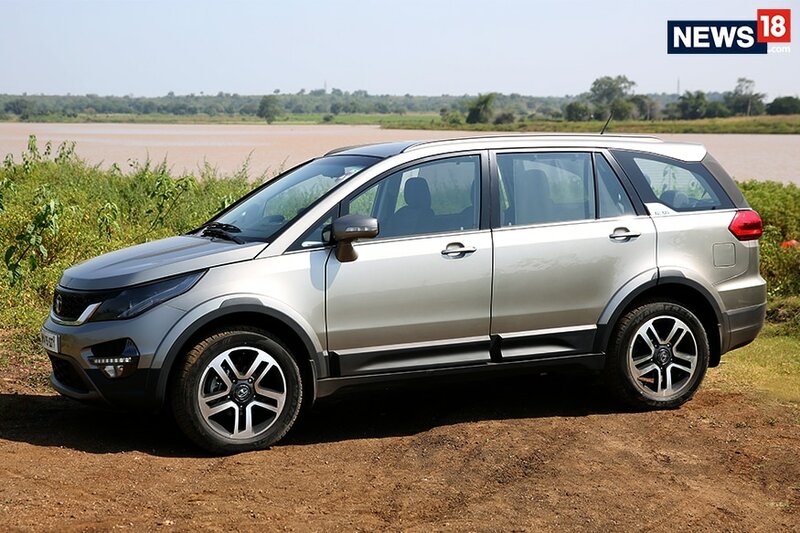 In terms of safety features, the Hexa offers ABS, EBD and 6 airbags inside the cabin in the top variant. The car isn’t perfect, though. There is a bit of body roll, something that often happens with cars of this size. The engine noise also creeps in at high RPMs inside the cabin. The noise gets even more noticeable when you drive the automatic transmission variant. 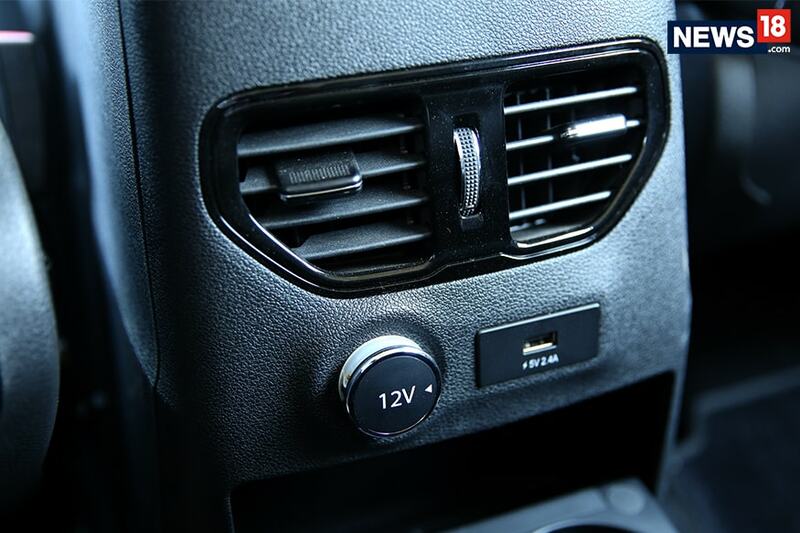 There were a couple of instances when, in slow-moving traffic, the car couldn’t go fast enough to allow the transmission to upshift, and the engine stayed at high RPMs, and hence, felt rather noisy inside the car. The manual transmission variant has the drive mode selector placed on the centre console, which takes up valuable knee-room and could be a hindrance for drivers taller than 6-feet. When you have such a feature-loaded car, then the things it misses out becomes more evident, and we wished that it had a sunroof. As of now, there is no news about the price of the Hexa. We expect it to be around the price segment of the Mahindra XUV 500 and will be going head-on with the Toyota Innova Crysta. 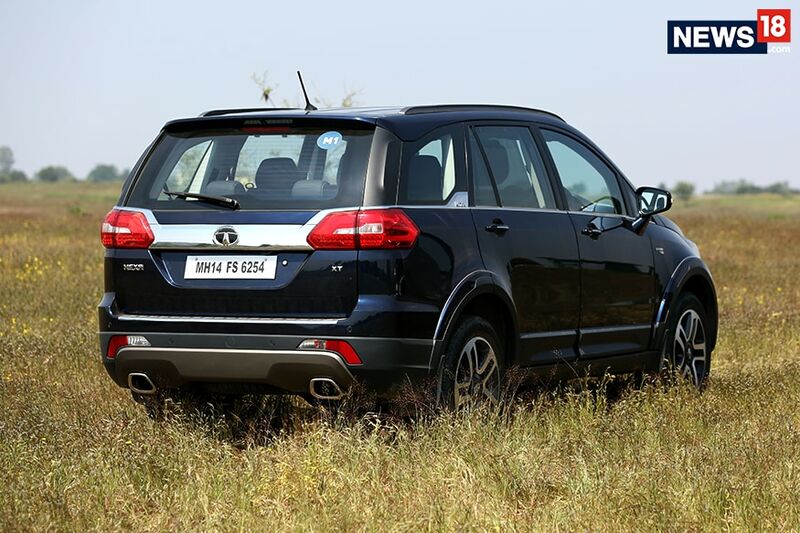 The Hexa shows how far Tata Motors have graduated when it comes to designing the car. It looks good, is feature loaded and fun to drive as well. It all boils down to how aggressively Tata prices the Hexa. The car is good as a package and will need to be priced accordingly, in order to convince people to actually go and buy a premium Tata Motors car. After all, isn’t it what the Aria was supposed to do in the first place?